Title: HUMAN PRUDENCE: or, the Art By which a Man may Raise Himself and His Fortune to Grandeur. Corrected and very much Englarged. Description: London, Richard Sare 11th edition. 1717 . Duodecimo tan roan gilt ruled to covers (rebacked/tips worn). 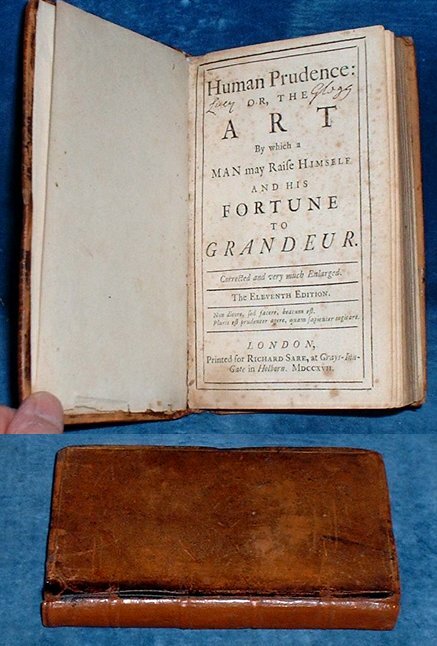 Titlepage (with ownership Lucy Glegg) in double ruled border +pp Dedication +pp Contents +254pp lacking last blank, last numbered page has Finis and nice tailpiece. Last 4 leaves with small corner loss not affecting any text. Pale foxing/browning mainly to edges throughout but a neat book of examples of coutesy, moral rectitude and courage.